A Dash of Compassion » Roasted hazelnut-almond granola clusters from Oh She Glows Every Day + a giveaway! I know you love cookbooks as much as I do, so I’m excited to share this recipe from Angela Liddon’s brand new Oh She Glows Every Day. I received a review copy of the book a little over a month ago and have been enjoying it immensely ever since. 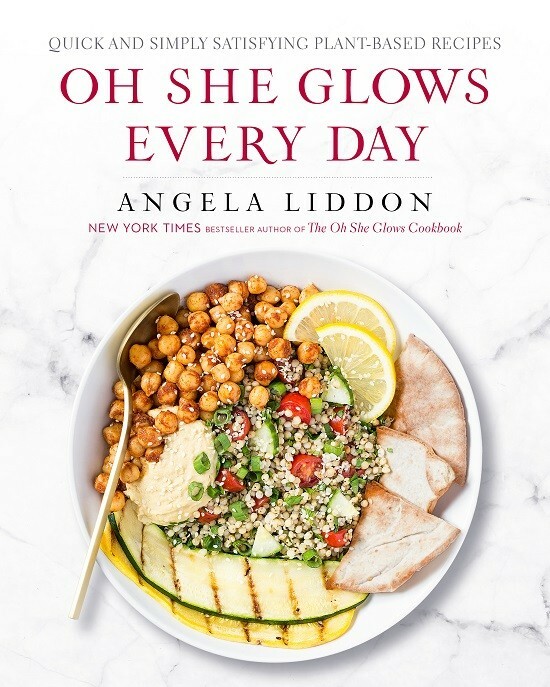 Featuring reliable and inspiring plant-based recipes that Angela is known for, Oh She Glows Every Day takes a slightly different approach than her first bestselling cookbook, The Oh She Glows Cookbook (read my review here), focusing specifically on quick and energizing meals for busy lifestyles. The book contains photographic glimpses into Angela’s busy life with her husband Eric and daughter Adriana (just last week, newly born Arlo joined the family!) and it is clear that her active lifestyle as a mother and entrepreneur shaped the new book’s emphasis. In addition to the 100 recipes for smoothies, breakfasts, snacks, sides, entrees and desserts included in the book, Angela also shares easy-to-make homemade staples like all-purpose cheese sauce, coconut whipped cream, balsamic vinaigrette dressing and vegan parmesan, plus useful information on essential pantry ingredients and making meals that are kid-, allergy- and freezer-friendly. One thing I admire about Angela is that she doesn’t over complicate her recipes. Her simple and accessible approach to recipe development makes her recipes attractive to anyone, vegan or otherwise, looking for recipes that satisfy, nourish and inspire. Plus, there’s something to be said about her carefully written instructions, which are key to creating reliable recipes that work time and time again. I’ve made more than a few recipes from the book so far, including the freshest guacamole, fresh cherry tomato salsa, homemade sunflower seed butter, nut-free dream bars, flourless peanut butter cookies and coffee shop-worthy hazelnut milk. A few other recipes I’ve bookmarked: overnight hot oatmeal power bowl, curried chickpea salad, crispy smashed potatoes and oh em gee veggie burgers. Beyond the recipes, the bright, fresh, clean design and photography of Oh She Glows Every Day won me over immediately. Ashley McLaughlin of Edible Perspective did a steller job photographing the recipes. It’s a book you’ll want to proudly display on your book shelf or coffee table. This recipe for super-addictive roasted hazelnut-almond granola clusters has been one of my favourites in the book so far. It’s sweet and crunchy, and brimming with toasted hazelnuts, and some chocolate chips and dried cherries thrown in for good measure. Although the recipe calls for the use of the homemade roasted hazelnut-almond butter from page 77 of the cookbook, Angela mentions in the recipe’s headnote that you can substitute raw or roasted almond butter, which is what I did since I already had some on hand. And you know what? It was incredible. Thanks to Angela and her publisher, I’m able to share the granola recipe with you today! I’ve also included the halzenut-almond butter recipe too. Make that first for use in the granola, or substitute almond butter instead. If you’d like to experience more recipes from this wonder of a woman, scroll down for a GIVEAWAY for a copy of the book! Preheat the oven to 300°F (150°C). Spread the hazelnuts over a small baking sheet and the almonds over another small baking sheet. Put both in the oven and roast for 12 t o 14 minutes, until the hazelnut skins have darkened, cracked, and are almost falling off. Let the nuts cool on the sheet for 5 minutes or so. Transfer the hazelnuts to a damp dishcloth and rub vigorously until most of the skins fall off. The goal is to remove most of them, but a few stragglers are okay! Transfer the almonds and skinned hazelnuts to a heavy-duty food processor and process until a smooth butter forms, 5 to 10 minutes, stopping to scrape down the bowl as necessary. With the processor running, slowly add the sugar, vanilla, cinnamon, and salt to taste through the feed tube. Store the nut butter in an airtight container in the fridge for up to 1 month. Preheat the oven to 300°F (150°C). Spread the hazelnuts over a small baking sheet and the almonds over another small baking sheet. Put both in the oven and roast for 12 to 14 minutes, until the hazelnut skins have darkened, cracked, and are almost falling off. Let the nuts cool on the sheet for 5 minutes or so. Transfer the hazelnuts to a damp dishcloth and rub vigorously until most of the skins fall off. The goal is to remove most of them, but a few stragglers are okay! Chop the hazelnuts and almonds and set aside. Line a large baking sheet with parchment paper and keep the oven set to 300°F (15°C). 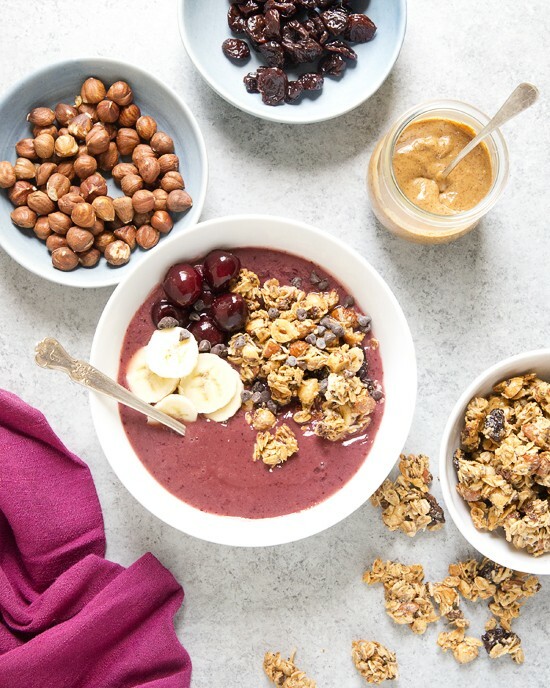 In a large bowl, stir together the chopped hazelnuts and almonds, oats, shredded coconut, chocolate chips, cherries, chia seeds, and salt. With a spatula, scoop the wet mixture on top of the dry mixture, being sure to get every last drop. Stir well until thoroughly combined. Scoop the granola mixture onto the prepared baking sheet and spread it out into a thin layer, no more than 1/4- to 1/2-inch (5 mm to 1 cm) thickness. Try to space out the granola as much as possible so it has room to breathe while cooking. Bake for 10 minutes, then rotate the pan and bake for 8 to 12 minutes more, until the bottom and edges of the granola are just starting to turn golden (the granola itself will still look a bit pale in color). The granola will get crispy as it cools. I wouldn’t want to tease you with a recipe from Oh She Glows Every Day without giving away a copy too! This giveaway is open to residents of Canada and the US. Enter using the widget below and I’ll choose a random winner on Thursday, October 20th. Good luck! Ooh these clusters look delicious. I would love to win and see what other delicious recipes are inside! Yum! Would love to win a copy of the book! I’m dying to try everything in Angela’s new book! Her recipes are always so spot-on and delicious, and I know these will be no exception. 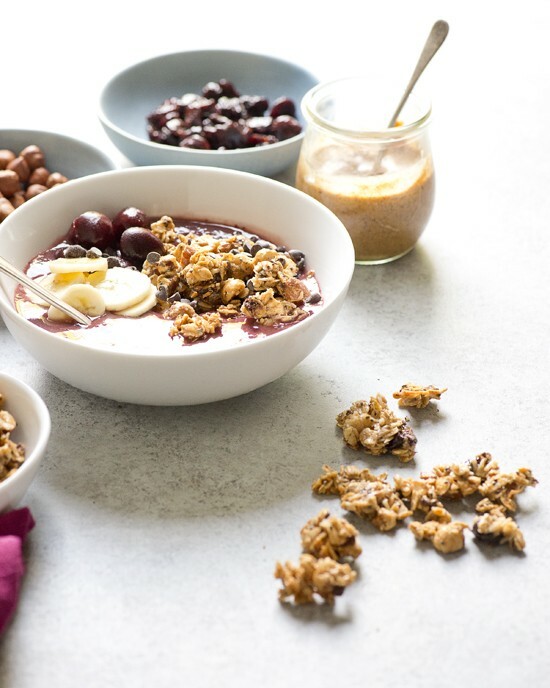 Thanks so much for sharing the granola recipe — I am going to try this immediately! Thanks for sharing this granola recipe. It sounds like a wonderful combination of many of my favourite ingredients – I know I’ll love it! I’d also love to have the new Oh She Glows cookbook because all of a sudden, our life got a lot busier than it already was, so this book’s focus is perfect for where we’re at right now. Also, with this new stressful schedule, it’s often hard to come up with good ideas for meals; Angela’s recipes would be a huge help as they’re always a great source of inspiration! Angela’s recipes are always a hit with my non-vegan friends and family! I would love to cook meals for them from her second book! 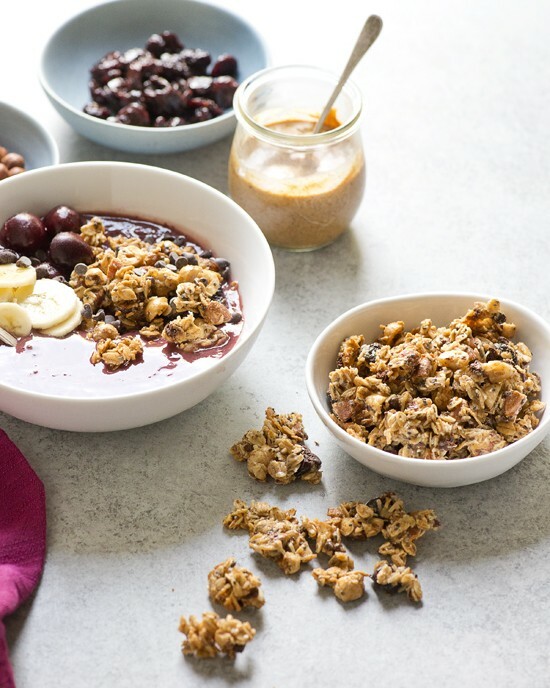 I would love to find some new inspiration for recipes especially breakfast and this granola looks so delicious! I enjoy the recipes on Angela’s blog and am very interested in seeing all the great recipes this book has to offer. I am not vegetarian or vegan but do eat mostly plant based foods. My wife and I are always in search of new, exciting and healthy recipes to make for our family. Our garden has flourished the past couple of years and we would love to learn how to add different twists to our dinner plates. I would really love to win a copy because Angela Liddon is my idol. She helped me with an eating disorder through her recipes and always gives me inspiration to try new and delicious food. This looks so delicious! I bet cranberries would taste phenomenal in it as well! Clearly I have Thanksgiving food brain right now. I definitely need some cooking inspiration, and this book looks fantastic! Thanks for the chance. 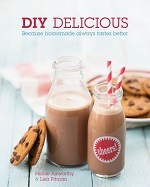 I have the first Oh She Glows cookbook but I’m a busy student so I’d love to check out this book with quicker recipes! I am a vegetarian with a large incline towards vegan dishes. I love fresh, flavorful, plant based food and Oh She Glows is the perfect source for meals of this sort. I’d love to win her cookbook! Thanks for sharing a tasty recipe and for this wonderful giveaway. I’ve loved Angela’s first book so I’m have complete confidence this newest release is full of awesome vegan recipes even omnivores will enjoy. (I’m the lone vegan in our house). Thanks! I want a chance to try all the yummy looking recipes in the book. Great blog and great giveaway! I love Angela and her blog and would love to have this cookbook in my collection…..it sounds divine! Ah this is beautiful!! I love the addition of dried cherries. Would be SUCH perfect sweet combo with the nut butter. I would loveeeee to get my hands on Angela’s beautiful new book. Such a lovely book and blogger OSG is great addition to vegan cooking world. Thanks so much for featuring. i am such a big fan of oh she glows blog! i would love to win! I absolutely love the Oh She Glows Blog. I’m a newly wed, and trying to get my husband and I to eat healthier, and Angela has been such a help and inspiration! I would LOVE to win a copy of her new book!!! Angela is always so careful to get her recipes and photos “just right”. She is so committed! I loved her first cookbook soooo much! I can’t wait to check out this one! I’d love to win the book so I can make all of the wonderful recipes! I really like the recipes from her website and first book so I’m sure I would get a lot of use from this book too! I want to win a copy of this book for my daughter, who has recently gone gluten-free to attempt to get rid of health issues. She is already plant-based, so this would be perfect. I’ve looked at this book on Amazon and it looks like one I’d really like to add to my collection! Oh She Glows is my favorite blog and I love the quick, easy and healthy focus of this book! I love Oh She Glows! She is what got me started on plant-based eating. Thanks for hosting this giveaway! Because I love cooking new dishes to try! 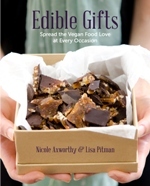 i want to win a copy of this book for my mother in law, who has been a vegan longer than i have and inspires me daily! 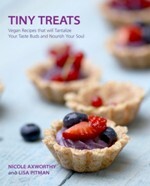 whenever she comes to visit she always helps me plan/make/try new vegan recipes and i know she loves vegan cookbooks but doesn’t have this one yet :) i just ordered it for myself a couple days ago but would love to surprise her with a copy! I’d like to win, because I’ve enjoyed many of her recipes over the years. I like that she uses healthy ingredients. My kids and I adore OSG recipes and I know her new book would be a hit at my house and among my friends! This is the time of year when I start making granola every weekend. Looking forward to trying this yummy looking version. Thanks! 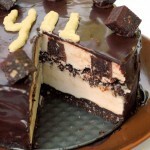 i absolutely love angela’s blog and recipes! i would to add her new cookbook to my small collection as i just moved in with my bf and also just started working full-time (just graduated in may!) 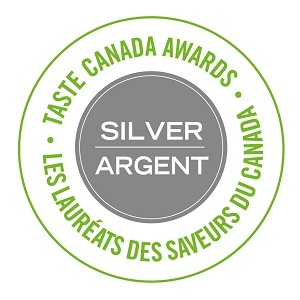 and am looking for some new easy recipes to add to my regular rotation! I love her first cookbook and would absolutely love to try her second one! Great recipe! Looks kid friendly to me which is always what I look for! I have a friend who swears by this book for her family. I would love to get my own copy. I love Angela’s blog and don’t have any of her books yet! 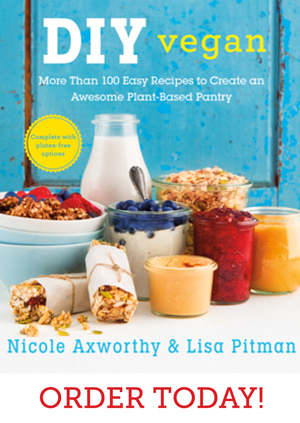 I would love to win this book because I am always looking for new yummy healthy recipes. I love her blog and would enjoy this book! I loved Angela’s first book so I’m so curious about what else she can bring to the table (so to speak) in the second! I would love to win this because I enjoyed the first Oh She Glows cookbook so much! Yuummm…it’s dinner time, but I’m already dreaming about breakfast! I love Angela’s recipes because they’re easy to follow and the results are delicious. I would love to have a copy of her new cookbook. I’d like to win a copy of this book because I am on the hunt for vegan resources and recipes. The resources I’ve tried to find online do not always feel appropriate for my lifestyle but Oh She Glows has lots of easy recipes. She makes being vegan seem do-able! I’m a big fan so would love this cookbook. Oh I would love to see this in the flesh! I love her blog and recreate her recipes all the time. Great giveaway! I would love to win this cookbook! I’m dabbling in the plant-way of eating, and she always has a knack for getting me to try things I wouldn’t otherwise.